Cancellations. Start To Focus On This. Your team could be thinking this about cancellations. If a patient gives enough notice it is OK. Your team still has to spend time changing appointments which means this takes time away from more effective and important parts of their day. So really it isn’t OK. Thinking cancellations are OK if you are given enough notice sets your team up to believe that ALL cancellations are actually OK.
You want to stop this before it happens. ALL Cancellations have a negative affect on the appointment Book, your business and your patient’s health and the time it takes to reschedule or follow up patients can easily get out of control. Are the cancellations in your business starting to get out of control or are they already way out of control. The best way to approach cancellations is to always focus on prevention of cancellations. The first step to stopping cancellations is preventing cancellations in the first place. Look at how you set up the appointment. Make sure your patient is fully aware and committed to going ahead with treatment and the appointment. Often I see the commitment to the treatment with the dentist but then there is little or no definite commitment to the appointment and the time allocated to them. Changing this will make a huge difference with your patients. It comes down to the type of positive, assertive and definite language you use with your patients. If you want your patients to stick to the appointment then use language that says to your patient that the appointment time is set and confirmed. The next step to stopping cancellations is to not accept cancellations so quickly. I know some patients have valid and legitimate reasons for needing to change their appointments and do still want to have the treatment done, but we all know that most cancellations are just because the appointment has become inconvenient or patients are trying to avoid having treatment for a number of reasons. Aim to keep your patient in their appointment if they call to cancel. Find out their reason for the cancellation and offer solutions to keep them in their appointment. Why are your team so quick to reschedule the appointment? Now they have to find a new appointment. An appointment that someone else would have taken. They also have to find another patient to take the now available appointment. How much easier would it be to not have to do any of this cancellation dancing and keep your patient in their appointment. What a better world it would be if you could stop those cancellations, wouldn’t you all agree? Better for you and better for your patients. Give me a call if you want to know more about the specific language to start using so you can finally reduce those annoying cancellations. Get ready for my Bathurst, NSW Master Class- Friday 29th March 2019. Click here on this link to register. Perth Master Class- Friday 21st June 2019. There will be more Master Class dates for 2019 released very soon. Dental Phone Excellence is a simple to implement complete Phone Answering system I developed that helped me to build an extraordinary dental practice in the heart of working class western Sydney. 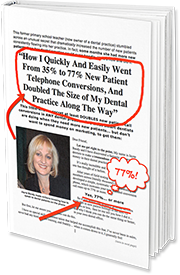 If you’d like to know more, download my sixteen page FREE special report “How I Quickly and Easily Went From 35% to 77% New Patient Telephone Conversions, and Doubled The Size of my Dental Practice Along the Way” and discover some of the many costly mistakes being made on your phone…..